The Kent Mathews Lectureship is an important part of the Vernon Grounds Institute of Public Ethics. Kent Mathews graduated from Denver Seminary in 1985 with a degree in counseling. During his years at Denver Seminary, he was most heavily impacted by the life and ministry of Dr. Vernon Grounds. Kent's strong sense of both justice and compassion for the marginalized characterized his life and work until his death in 1994. To honor Kent's life and continue his legacy in the area of Christian social ethics, Mr. Randall and Dr. Alice Mathews have formed this endowed lectureship so that similar passion may be inspired in the lives of future Denver Seminary students. This annual lectureship seeks to cultivate a biblical, social ethic by addressing aspects of the obligations, virtues, values and vision essential to a thoroughly Christ-like social ethic. Specifically, the lectureship explores the aspects of these four themes by addressing the biblical, theological and philosophical nature of our obligations; the personal character dimensions of social ethics; the values reflected in social justice; and the concrete responses to which we are called. 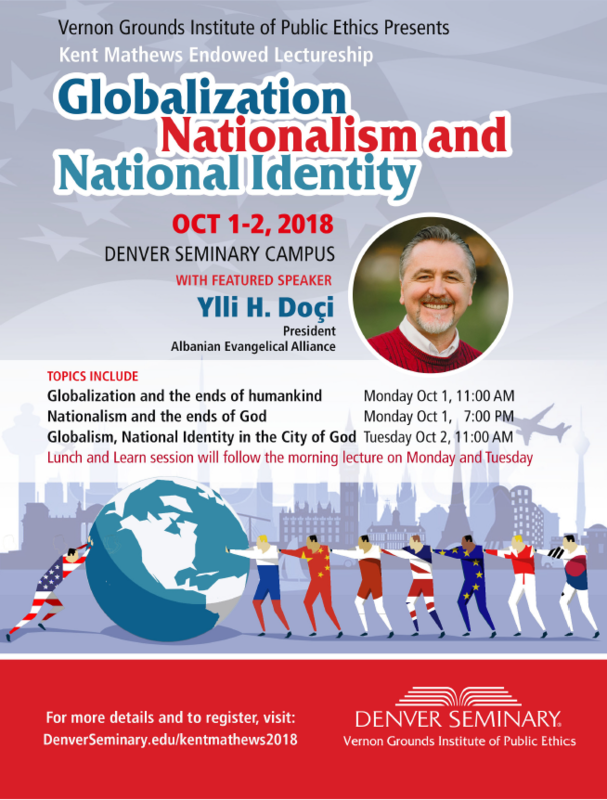 This year’s program is a two day event featuring Dr. Ylli Doçi, President of the Albanian Evangelical Alliance. The Kent Mathews presentation will be made during the Seminary’s chapel service on October 1-2, 2018, starting at 11:00 a.m. Each lecture will be followed by a "Lunch and Learn" discussion event during which these topics will be explored in further detail. Dr. Ylli Doçi: "Globalization, Vertigo, and Christian Responsibility"
Dr. Ylli Doçi: "Nationalism and Democratic Sovereignty"
Dr. Ylli Doçi: "Anchored and Layered Identity"
Ylli H. Doçi was born and raised in an Albanian Muslim family in Burrel, during the height of the communist regime that declared Albania the first atheistic state in the world in 1967. He grew up an atheist as religious practice was forbidden until the harsh communist regime of the country fell in 1991. A year later, surprised by the truth of the gospel introduced to Albania by foreign missionaries immediately after communism fell, Ylli became a believer in Jesus Christ. Ylli graduated from the Academy of Fine Arts in Tirana, Albania with a Master’s Degree in Sculpture in 1995. 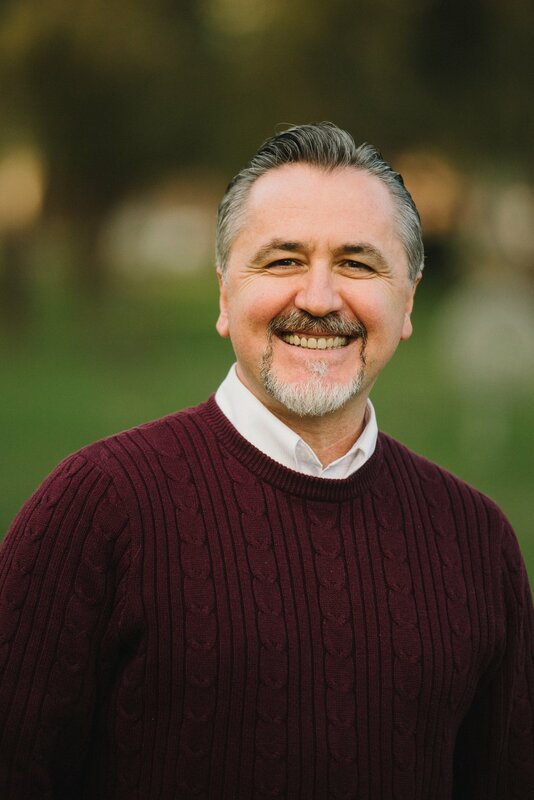 Upon graduation he and joined the staff of Cru Albania, serving in Tirana with the university ministry until 1999. Following the end of the war in Kosovo, Ylli led the first team of Albanian missionaries to serve beyond the country’s borders, successfully establishing a Kosovo student ministry that continues to thrive to this day in Prishtina. In 2003, Ylli graduated with honors from Denver Seminary, having earned a Master’s Degree in Philosophy of Religion. Thereafter, he returned to Albania, and in 2006 became the first Albanian national to assume the role of National Director of Cru ministries in Albania & Kosovo. During his tenure as National Director, the staff grew from 70 to 115 full-time members; the number of ministries increased to include church planting, family life, and executive outreach; with campus ministries thriving in five main university cities of Albania and mission teams in four countries beyond the Albanian border. In 2014, highlighting the need for healthy leadership transition in the Albanian culture, Ylli passed the mantle to his successor, who continues to further wonderfully the work for the Kingdom in Albania and beyond. Ylli has also been one of the founding of Cornerstone Church of Albania in 1995 and now leads a team of four pastor-elders at Cornerstone, one of the main churches in the capital city, Tirana. It is a delight to see this congregation not only continue to grow is size and faith but also multiply and today be part of a three church network closely cooperating together. In addition, he serves as leader of Albania’s International Leadership Foundation, an organization that seeks to bring the values of the gospel into the leadership of various spheres of society. In 2016, Ylli was elected president of the Albanian Evangelical Alliance of Albania, the umbrella organization for all evangelical Churches and institutions – a position he holds to this day. Evangelical Christianity as represented by the Evangelical Alliance is one of only five religious communities recognized by the Albanian government, alongside Sunni Muslim, Bektashi Muslim, and Orthodox & Catholic communities. One of Ylli’s passions is to rally fellow believers to the extent that by the end of 2020, everyone will know someone who truly follows Christ. Ylli holds a doctorate in Social Anthropology from the European University in Tirana. He has written several journal articles related to inter-religious tolerance and nationalism, and authored a book about sharing the gospel with Muslims. A well-known personality in Albania, he has been invited to speak on several important national TV programs on a wide-range of issues such as family, religion & politics. Ylli and his wife of more than 20 years, Nikki, reside in Tirane with their teen-aged daughter, and keep in close touch with their son, a student at Wheaton College.